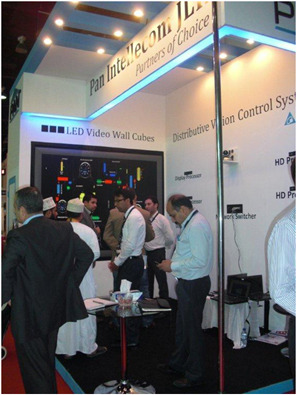 InfoComm MEA ,2011 provided a definitive pro-AV and systems integration technology platform to showcase latest products, as well as update and educate AV end-users and systems installers in the Middle East and African region on AV technologies and applications. The objective was to utilize this professional platform to debut their latest products, technology and solutions and most importantly to connect with professional end-user buyers across a wide spectrum of vertical markets. The innovative cooling solution provides a fully closed system ensuring long lifetimes for LED's. Moreover, this novel cooling technology obviates the need for any external electro-mechanical support, thus offering a completely fail safe operation. Less than 2W power consumption during the standby mode. Delta'sDistributed Vision Control System is one of the most advanced control systems designed specifically for control room visual display systems combining the latest advances in digital signal processing technology with recent improvements in video compression rates, Delta DVCS enables customers to capture, distribute control and display high resolution HD video signals over an IP network –reliably & cost effectively.